Good Choice Reading: BLOG TOUR - Interview w/ authors of UNLEASHED, Nancy Holder & Debbie Viguié! BLOG TOUR - Interview w/ authors of UNLEASHED, Nancy Holder & Debbie Viguié! Today on our blog tour stop we bring you an interview with both Nancy Holder and Debbie Viguie, about their latest book, Unleashed. 1. Hello Ladies! Could you tell us a bit about yourselves and your new novel, UNLEASHED? Debbie - I’m proud to be one half of the Holder/Viguié writing team. In addition to writing with Nancy I also write several series by myself. I write for both the Young Adult and Adult markets. I write fantasy, mystery, and thrillers. I write both secular and religious stories. This is the third series that Nancy and I have written together and we are so proud and excited. 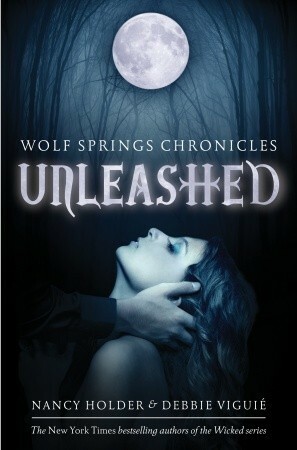 Unleashed is the first novel in the Wolf Springs Chronicles trilogy. It follows Katelyn McBride as she is forced by the death of her mother to move to a remote town in the Ozark mountains to live with her grandfather. Wolf Springs hides many secrets, though, and more than just werewolves lurk in its woods. Nancy —I’m proud to be the other half of the Viguié/Holder writing team. We’re celebrating ten years together and eleven novels together so far! I also write other things without my esteemed partner, ranging from early readers up to adult. I’ve received four Bram Stoker Awards for my supernatural fiction, and a Scribe award from the International Association of Media Tie-In Writers for a novel I wrote based on the TV series, Saving Grace. I’ve written a lot of material for shows such as Buffy the Vampire Slayer, Angel, Smallville, and, as we say, many others. I’m so excited about Unleashed! Debbie and I are huge werewolf fans. We also love to tweak old stories and mythologies, so Unleashed is “more” than “just” a werewolf novel. Our characters have it going on in more ways than one. I was in Los Angeles last week and I drove past Santa Monica High School, or “Samohi,” which is where Katelyn has been going to school when the novel opens. I smiled and gave Kimi and Jane, two of Katelyn’s friends, a friendly wave. When I’m writing, the characters in our books become very real to me. I worry about all of them, even the bad guys. 2. How is it writing a book together, versus writing a book alone? Debbie - It’s amazing and fun. What’s great about our relationship is that her strengths are my weaknesses and vice versa. We are able to rely on each other. Also, the ideas are exciting because with the two of us working on a book it morphs into something awesome that isn’t necessarily what either of us would have done if working solo. Being a co-author means you have to put your ego aside and decide together what’s best for the story. Nancy and I have had no problems doing this with each other and the results have been remarkable! Nancy—I love working with Debbie. We’ve got each other’s backs 24/7 and even though we plot and plan our books, we’ve had many serendipitous, unexpected things happen. In Unleashed, we introduced a character we assumed would have a walk-on part and he has become very precious to me. I hope we don’t have to kill him! The other great part about writing together is that we’ve got someone else in the room with us, even though it’s a virtual, online room. Debbie lives in Florida and I live in San Diego, but it’s just like writing side-by-side when we’re working. Since she’s a bestie, that’s a great feeling! 3. What was the most challenging part about writing UNLEASHED together? Debbie - We made the rough draft about 25,000 words longer than what we were targeting. Together we had to go through and decide what to cut and what to save for the next book. It was hard, but we made it through! Nancy –Oh, that cutting, those horrible decisions. Luckily, we got to go to Disney World after all that gory major surgery. We had some great cheese at the Rose and Crown English pub and then when we went on the Maelstrom ride in the Norway pavilion at Epcot. Fun times. 4. Twilight comparisons turn some readers off, what can you tell us about the book that sets it apart from Twilight to ease those...fears? Debbie - Our fans know that whenever Nancy and I write a book together, nothing is exactly as it seems. Things are never simple. People are never who they seem to be. Unleashed is no exception. Although the story focuses around Katelyn there are many other stories playing out around her, each of which she touches and changes in her own way. Nancy – Exactly. We used werewolves as our jumping-off point, but our book isn’t “just” about werewolves and not “just” about running with the right pack. Life is complicated and we like to write about life. And death. Wahaha. 5. Was it a difficult transition going from witches to werewolves? Debbie - We love supernatural creatures of all types! It also helped that our vampire series, Crusade, had both witches and werewolves in it. Nancy – Yes. We wound up loving our werewolf in Crusade so much that the other characters got jealous. There’s a lot of jealousy in Unleashed. Our male characters might have been raised to behave like Southern gentlemen but I swear, a few of them act like animals. 6. We love sharing teasers with our followers or some type of sneak peek, Can you share one with us today from UNLEASHED? Thank you Nancy and Debbie for stopping by today and answering our questions. Unleashed sounds like a great book and we cannot wait to read it!